Modern Haiku. The Heron's Nest. Roadrunner e-magazine. GEPPO magazine. Poets: Bashō. Billy Collins. Jane Hirshfield. Marianna Monaco. Ouzel (James Arnold). Patricia J. Machmiller. Shiki. Genji: The Tale of Genji. Ise: Ise Monogatari. Written in Japan in the early 11th century, the poet Murasaki Shikibu wrote The Tale of Genji. The world's first psychological novel. 45 chapters, each with prose and at least one tanka. The Tale of Genji unfolds over 75 years, 3 generations, and 4 imperial reigns, and presents over 500 characters. From Haruo Shirane's The Bridge of Dreams: A Poetics of 'The Tale of Genji' (1987, p. 120). Throughout The Tale of Genji Murasaki Shikibu reveals that the individual is defined not so much by thought and action as by the emotional intensity with which he or she perceived the world. From Haruo Shirane's The Bridge of Dreams: A Poetics of 'The Tale of Genji' (1987, p. 230). The best translation I have read is a 2001 translation by Royall Tyler: The Tale of Genji. See Haruo Shirane's 1987 analysis: The Bridge of Dreams: A Poetics of 'The Tale of Genji'. 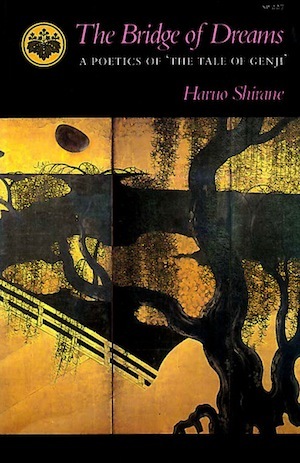 Haruo Shirane's The Bridge of Dreams: A Poetics of 'The Tale of Genji' is the most readable introduction to the Genji that I've yet read. Shirane's book is especially helpful, even before you read a translated text. In four parts: (1) The Aesthetics of Power; (2) Hidden Flowers; (3) Lyric Tragedy; (4) The Spiritual Quest. A very handy Appendix A which summarized the principal characters. Appendix B on the author of the original text Japanese and on the surviving Japanese texts. Notes (22 pages), a selected bibliography (16 pages), and 12 pages of index. Mostow, Joshua S., and Royall Tyler, translators (2010). The Ise Stories: Ise Monogatari. Honolulu, University of Hawaii Press. Shirane, Haruo, editor (2007). Traditional Japanese Literature: an Anthology, Beginnings to 1600, with additional translators. New York, Columbia University Press. The quotations are Copyright © 1987-2016 by the credited authors.